For sports fans, and fans in general, nothing beats meeting your favorite athlete, celebrity or musician and getting to capture that experience — a signed photo, shirt, etc. — take it home with you and proudly display it to your friends. There are many that would happily stand in long lines to get their favorite author to sign their new book with a personalized autograph, but for many others, acquiring an autograph is too pricey, time-consuming and static. 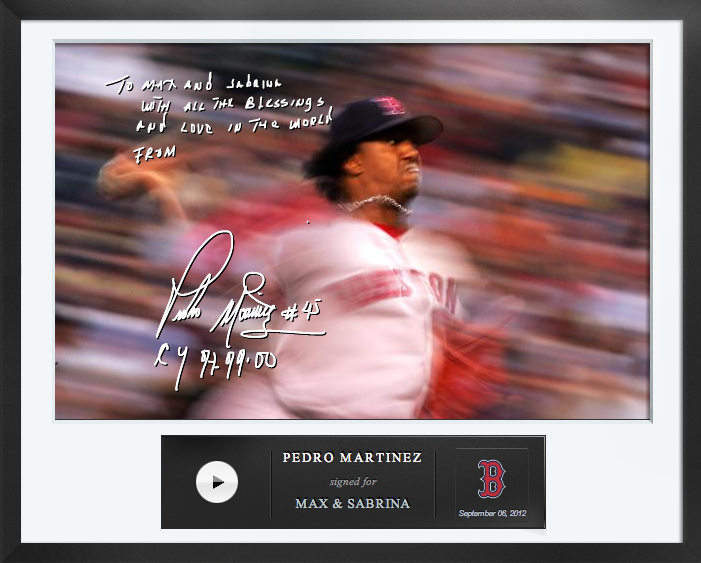 Six-month-old Seattle-based startup, Egraphs, is on a mission to create a next-gen experience around the autograph, turning this kind of memorabilia into something that’s multi-dimensional, personalized, sharable and mobile. Writ large, co-founders Andrew Smith, William Chan and Erem Boto hope that the venture can be a part of building a new, digital channel for fans to connect with their favorite stars – in this case, athletes. In fact, the company decided to start with baseball. Egraphs CEO and former Microsoftie David Auld’s brother, Brian, happens to be Senior VP of business operations for the Tampa Bay Rays, and through this connection, the co-founders were able to enlist Gabe Kapler, a long-time pro ballplayer who played for the Rays and has been able to leverage his relationship with other players to get Egraphs off its feet. And it’s been working well. Since launching last summer, Egraphs has gone from eight MLB players representing two teams to over 250 covering every team in the league. On top of that, to make sure that the core idea behind Egraphs remains defensible, the startup has been able to obtain exclusive licenses with MLB and its web division, MLB Advanced Media. In the six months since launch, Egraphs has been hard at work at securing deals with professional basketball players and teams. This past weekend, Egraphs officially expanded beyond baseball to the NBA, doubling its footprint in pro sports, thanks to its new agreements with more than 70 NBA athletes, which are now live on its website. That’s over 300 pro athletes on board. But how does it all work? The best part is that the process is fairly straightforward. Fans go to Egraphs’ homepage and look for their favorite athlete. If the athlete is working with the startup, they’ll be able to find their name on the site’s roster, where they can choose from a number of different high-res photographs (or templates) they want personalized. Depending on the player and the template, prices range from $25 to $115 for the whole package. Fans choose the photo they want the player to sign, pay for it, and then send the athlete the individualized message that they want included. Once the player receives the message, they can open it and sign the photo on a custom iPad they’ve received from Egraphs, which they use to sign the photo along with the written personalized message. But the best part — and what really differentiates this from your average digital autograph experience — is that Egraphs all include personalized audio messages, along with the photo and signature. That means fans get to hear, for example, Pedro Martinez congratulate them on the birth of their child, or for getting married. (See below.) That’s an interaction that one generally doesn’t enjoy when waiting in long lines for an MLB star to sign an autograph — or from traditional digital autograph vendors. Plus, the signature and audio message are all verified, as Egraphs meets with athletes once they agree to become a part of their program and take handwriting and voice prints. When the athletes sign and record their personalized messages, the startup confirms their authenticity, and only then is the Egraph actually sent to the fan. For athletes that care about giving back to the fan bases that have helped make them into global stars, Egraphs is proving to be an effective way to do that. After fans check out their personalized Egraph, they can share it via their social network of choice, and even tweet it back to the athlete to say thank you or try to engage them in conversation. Athletes end up loving this opportunity to directly engage fans just as much as fans get a kick out of being able to share these messages with their friends and Twitter followers. 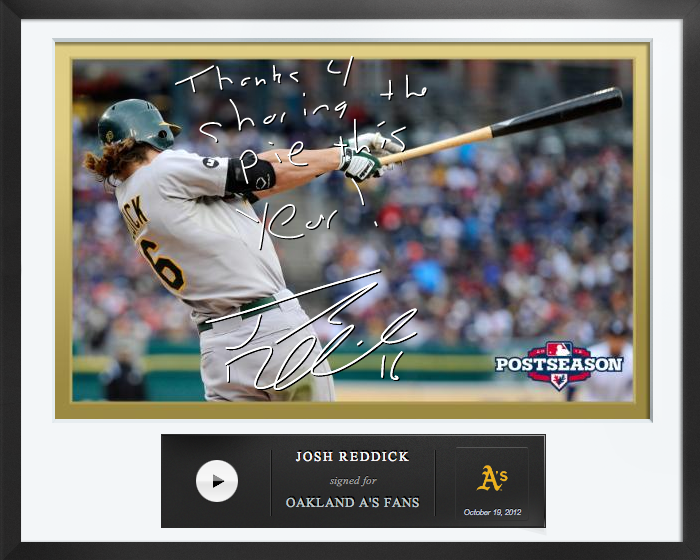 After the Oakland Athletics finished the 2012 season, for example, outfielder Josh Reddick tweeted out an egraph thanking fans for their support of the team, which the co-founders report was retweeted over 300 times, received 300 favorites and was viewed by thousands of people. While some might not see Egraphs as being true collectibles, seeing as they reproduce facsimile autographs, and thus that they don’t have quite the same re-sale value, the co-founders believe that the process has value not only in terms of merchandizing and security for athletes (through the biometric verification of their written and audio messages) but in it the technology’s variety of potential use cases. Kapler sees Egraphs as not just being a vehicle for athletes, but for all celebrities — as an intimate, personalized way to connect with fans. Going forward, that’s just what the company plans to do, eventually moving past sports to offer messages from musicians, actors, and beyond. While Egraphs declined to give any specific stats or to share its current revenue, it does divvy up the price of each egraph with its athletes, allowing both sides to benefit, and many athletes choose to donate that money to charity. The company also said that, so far, “a large portion of users are returning customers,” and purchase multiple egraphs. Some, they told us this weekend, are even in the double digits. In short, only six months in, the company is finding favor with both fans and athletes and it plans to expand quickly in the coming quarter — into all parts of the entertainment world. Whether it will disrupt traditional autograph-seeking remains to be seen (probably not), but it certainly brings a lot of new exciting possibilities into play. Find Egraphs at home here.